The Montana Grizzlies reported to the first fall camp in the second era of Griz football under head coach Bobby Hauck Monday, with student-athletes moving into the dorms, getting fitted for equipment and completing physicals in the training room. One of the first things the team’s newcomers may have noticed was this season’s #MontanaTough rallying cry that adorns this year’s team schedule poster. 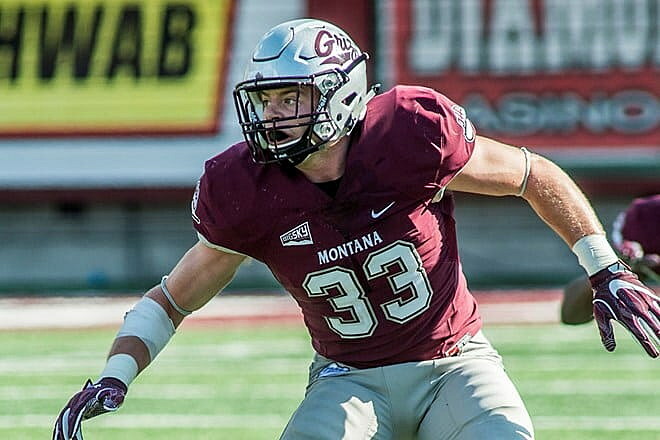 It’s an attitude being embraced by the 2018 Grizzlies, and nowhere more so than in a defensive unit that is shaping up to be one of Montana’s best in recent memory. As the Griz prepare for the first practice of fall camp on Wednesday at Dornblaser Field, defensive coordinator Kent Baer and his staff will begin putting the pieces together on a depth chart based on that toughness. He doesn’t want flash-in-the-pan toughness, however. Baer says he wants this year’s defense to live up to its potential with every rep, on and off the field. “I’ve always said the truest measure of performance is consistency. If you become a consistent player, the coach will trust you. Everybody makes mistakes, but I’m looking for consistency, and there is a lot to that. I’m talking about consistency in everything we ask them to do, in terms of playing hard, being tough and being a leader,” says Baer. The veteran defensive mentor returns the most experienced group on this year’s Griz squad with 18 lettermen returning, five starters and 13 more players who saw action in five or more games last season. It’s a group built with eleven upperclassmen and a core group of seven seniors that Baer says is ready to lead from the front. The man set to lead that charge is senior linebacker Josh Buss, who, over the last month has received almost every major preseason accolade an FCS player can receive, and even one most FCS players never get a sniff at. Since mid-July, Buss has been named the preseason Big Sky Defensive Player of the Year, a STATS first-team preseason All-American, was named to the Buchanan Award watch list, and was the only FCS player to be put on the Butkus Award watch list for the nation’s top linebacker – at any level. High praise, but praise that Baer says is not taken lightly. “I think it’s well deserved, and I think it’s great motivation for him, and great motivation for the team when you’ve got a guy like that the others know they can count on,” said Baer. Buss will be the driver of a strong linebacker corps that includes fellow senior Shayne Cochran and up-and-coming star Dante Olson, a two-time winner of the Hauck Family Special Teams Player of the Year award who will get a crack at a starting job as a junior. That passion for results is something Baer says drives the entire linebacker group as they work toward kickoff on Sept. 1. Following strong spring performances, sophomore Jace Lewis and freshman Marcus Welnel will add substantial depth to the group. Welnel, along with Cochran, led the defense in tackles during the Griz Spring Game, logging seven each. Another group expected to, literally, lead from the front in Montana’s defensive unit is the D-line. It’s a group where the Griz have traditionally excelled, with legends like Zack Wagenmann and Tyrone Holmes (to name a few) disrupting opposing offenses. 2018 looks to be no different. Carrying on the #37 tradition this season (and next) is Jesse Sims, a junior who has moved back out to defensive end after bulking up to play D-tackle last year. Sims started all 11 games as a sophomore and posted the most tackles of an interior lineman with 43 total takedowns. The former “Offseason MVP” possesses the strength and speed to cause a threat to nearly anyone he faces. Joining Sims at D-end is senior Reggie Tilleman, himself a former tackle who has bided his time and groomed his game behind some of UM’s best-ever, like Wagenmann and Holmes. A two-time Academic All-Big Sky selection, Tilleman is expected to play a significant leadership role in 2018, and at 6-4, 270, has the size to back up his smarts. Anchoring UM’s defensive front is the mountainous David Shaw, a transfer from Maryland in 2016 who tips the scales at 315-plus pounds, but agile enough to post 22 tackles and 3.5 TFLs in 2017. When Hauck and his staff took over at the end of 2017, one point of concern for the team was the depth in the defensive backfield and at safety. With senior Evan Epperly returning, the addition of Arkansas transfer Reid Miller and the NCAA granting an eligibility waiver to Robby Hauck, free safety is now a deep position, with each able to contribute. At strong safety, Josh Sandry returns for his junior year after a breakout sophomore season where he notched three interceptions, and Arizona transfer Gavin Robertson turned plenty of heads during the spring season with his physical ability. Montana’s group of cornerbacks may look unproven on paper, but don’t let the youth of this group fool you. With strong outings in the spring from Gavin Crow, Dareon Nash, and Kobey Eaton (who returned an interception for a TD in the spring game), the corners have come a long way during under coach C.J. Cox. Baer thinks the group has the talent to swim when caught on an island. Montana returns for day two of fall camp on Tuesday, consisting of team lifts and meetings. The first practice is set for 2:30 on Wednesday.